There are 9 playable races in ESO and you can choose any race you like, but you should know that this choice is also important because different races have different racial skills. 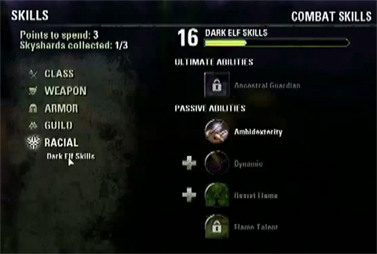 Racial abilities are a set of unique skills available to each race. In general, all abilities are inspired by TES lore and you will find a lot of familiar skills if you have played single player TES games. Each race has 4 passive abilities. The first is always unlocked by default. These passive abilities give you different passive advantages, but are not unlocked from the beginning; you need to unlock them during the game. Each race has a passive ability that increases skill experience gain while using a certain weapon type. You should understand that it is not something that should influence your weapon choice a lot. Such passive abilities increase the speed of leveling up definite weapon trees. For example, Nords can level Two-Handed weapon faster than other types, but the level cap stays the same. The passives don't give any bonus levels. Each race also has a passive that increases resistance to a specific damage type. As you probably know each race has unique appearance, ancestors and territory. All these parameters affect their bonuses. For example, Nords live in Skyrim, where The climate is extremely cold. As a result, all Nords have natural resistance to Cold damage. Likewise Argonians are reptilian and so have natural resistance to Poison and Disease damage. What is the difference between other groups of skills, for example Weapon, and Racial skills? The difference is that any character can master any Weapon ability, but racial skills are unique for each race in Elder Scrolls Online. You can not change your set of racial skills, like you cannot change your class skills. How racial skills affect class choice? I do not think that you should pay a lot of attention to racial skills while choosing your class. 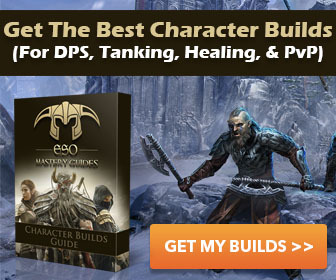 Elder Scrolls Online is a game that allows any race to choose any class. Any combination is absolutely playable because most of the passives will help any class. Although there are some races which seem suited for certain classes, the freedom of the gameplay shouldn't restrict your choice.